Pilot Dr. 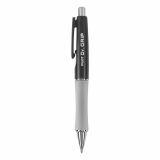 Grip Retractable Ballpoint Pen, Medium 1mm, Black Ink, Black Barrel - Dr. 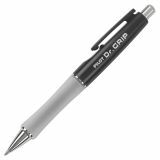 Grip is a revolutionary retractable cushion grip ballpoint pen that reduces required gripping effort, relieving stress and alleviating writing fatigue. Great for students, office workers and people who write a lot. Awarded the Arthritis Foundation's Commendation for Ease-Of-Use. Medium point. Refillable.